Oliver Doerell (Raz Ohara and The Odd Orchestra, Swod) and Roger Doering’s Dictaphone might not be the most prolific project around, but what they lack in frequency they make up for in sheer impact. „Poems from a Rooftop“ is their third album in ten years, and is the first to feature new member Alex Stolze (Bodi Bill, Unmap) on violin. Subtle electronic sounds and field recordings swirl around discreetly used wind and string instruments, merging into original arrangements between jazz, dub and klezmer. „Poems from a Rooftop“ catches a point in the band’s career where they appear perfectly at ease with their sound and able to distil the electronics and haunting ambience of their previous records into one deftly coherent whole. The result is an arresting and poignant narrative record, which is sure to stand as their finest to date. Besides various other band projects, the members of Dictaphone regularly compose music for dance, film, theatre as well as sound installations. Oliver Doerell has been a long-term collaborator of the German-Iranian choreographer and dancer Modjgan Hashemian. She herself looks back on a multi-faceted past in contemporary dance, having presented her productions at Ballhaus Naunynstrasse, HAU, Sophiensaele, Akademie der Künste in Berlin as well as in Istanbul and Zürich. With regard to our interdisciplinary approach, we are delighted that Modjgan joins Dictaphone for some of their pieces! „Poems from a Rooftop“ is out on Sonic Pieces now. 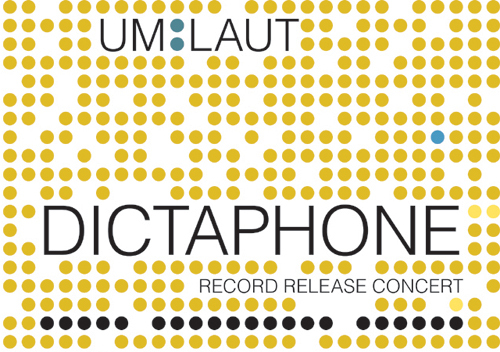 We love the record and we are happy to host the Record Release Concert on 4 May at Radialsystem and to present another ambitious project on the experimental range between classical and electronic instrumentation!